Highland Heights, Ky. - The Youngstown State women's basketball team outscored Northern Kentucky by 14 points in the fourth quarter to force overtime, however the Penguins dropped an 87-81 contest to the Norse on Saturday night at the BB&T Arena. Leading the Penguins was Mary Dunn, who finished with 18 points while India Benjamin had 17 points and nine assists. Freshman Morgan Brunner had a career-high 16 points, including three 3-pointers. 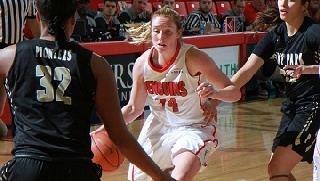 Jenna Hirsch also reached double figures with 12 points. With the loss the Guins fall to 4-10 overall and 0-3 in the Horizon League. Northern Kentucky improves to 5-11 and 1-3. Entering the fourth period, YSU trailed 58-44 before mounting its comeback. The Norse scored to open the period to build its biggest lead of the game at 60-44 before YSU tied the game at 71 on a free-throw by Benjamin with three seconds left. YSU made 27-of-64 attempts (42.2 percent) from the field while NKU was 28-of-55 (50.9 percent). YSU trailed 14-13 following a Dunn basket at the 1:34 mark of the first period. NKU scored the final four points of the period and the first two of the second to go up 20-13. YSU cut the deficit down to 23-21 with 6:46 remaining when Mailee Jones hit a jumper, but that's as close as the Penguins would get. Northern Kentucky scored the next nine points to take its first double-digit lead, and the Norse held a 42-29 advantage at halftime. NKU led for double digits for a fair chunk of the second half, but the Penguins made a big run in the fourth. Northern Kentucky led 64-53 with six minutes remaining when YSU went an 18-7 run to close out regulation. NKU scored the first four points of overtime, and it led 79-74 with 2:15 left. Brunner's three-point play shrunk the deficit to two, and it was two again when she made two free throws at the 1:35 mark. The Norse hit a jumper on its next possession to go up four, and they went 4-for-4 from the free-throw line in the final 40 serconds. Brunner scored seven of YSU's 10 points in overtime, and 11 of Benjamin's points came in the fourth. Youngstown State will begin a three-game homestand as it hosts UIC on Thursday at 5:15 p.m.